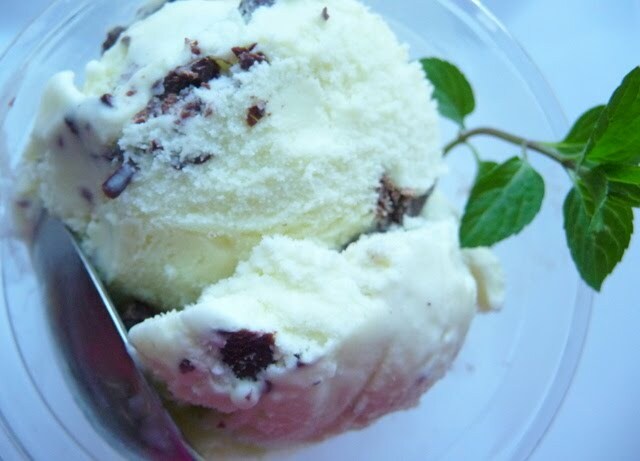 When I planted my herb garden this year – I decided to add in chocolate mint with the sole purpose of making real mint chocolate chip ice cream. I knew that mint tends to take over a garden so I purposefully kept it contained – although it still spread all over the garden. Well, when I thought I had enough mint to make this ice cream I harvested as much as I could – and realized it was only half of the amount called for in this recipe. Well, luck must have been on my side since this amount turned out to be perfect and definitely minty enough. 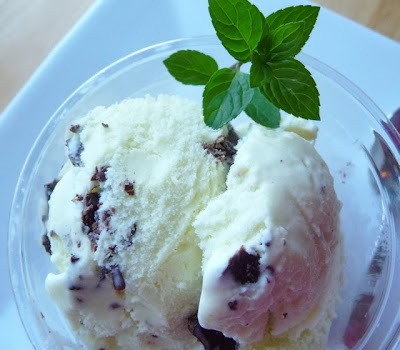 I loved the taste of real fresh mint in this ice cream – I’ve never tasted anything like this before – you can really taste the earthy-ness of the mint. It’s really hard to describe – but what I do know is that my (mint loving) husband really approved of this ice cream. I can’t wait to make this again next year! 1. In a medium saucepan, warm the milk, sugar, 1 cup heavy cream, salt, and mint. 3. Remove the mint with a strainer, then press down with a spatula firmly to extract as much mint flavor and color as possible. Once the flavor is squeezed out, discard the mint. 6. Cook the custard, stirring constantly with a heatproof spatula, until the mixture thickens and coats the spatula. If using an instant read thermometer, it should read around 170º F.
9. While the mixture is freezing, melt the chocolate in a small bowl over a pot of simmering water, or in a microwave oven on low power, stirring until smooth. Place a storage container in the freezer. 10. When the ice cream in the machine is ready, scribble some of the chocolate into the container, then add a layer of the just-churned ice cream to the container. Scribble melted chocolate over the top of the ice cream, then quickly stir it in, breaking up the chocolate into irregular pieces. Continue layering the ice cream, scribbling more chocolate and stirring as you go. When finished, cover and freeze until firm. Yet, another reason why I need to make Mint Chip Ice Cream!!! I have so much fresh mint at my house in a planter bed. Great recipe--thanks for sharing!